On today’s episode of THE FOOD SEEN, Vivian Howard returns to her roots, literally and figuratively. Raised in Deep Run, NC, amongst tobacco plants and hog farms, it was a move to NYC, prompted by a job in advertising, that lead her to the cooking. Kitchen tutelage from the likes of Wylie Dufrense and Jean Georges Vongerichten, she took this newfound knowledge back south to open her progressive eatery, Chef & The Farmer, to a town hit by recession in need of real, good food. Howard focused on developing a menu based in rural abundance surrounding her (e.g. blueberries, peanuts, sweet corn, okra, collards, watermelon, peaches, pecans, sweet potatoes). 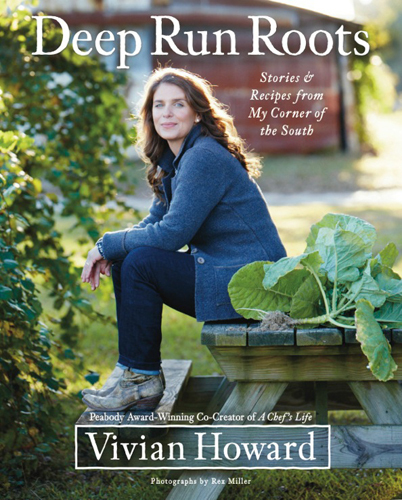 Devoted to her area of Eastern North Carolina, Howard began filming a documentary of the farmers behind this produce, which became the Peabody and Daytime Emmy award winning “A Chef’s Life” on PBS. In her bible of a cookbook Deep Run Roots, hear the stories behind Blueberry BBQ Chicken and Pecan-Chewy Pie! Episode 300 | Molly Yeh, "Molly on the Range"